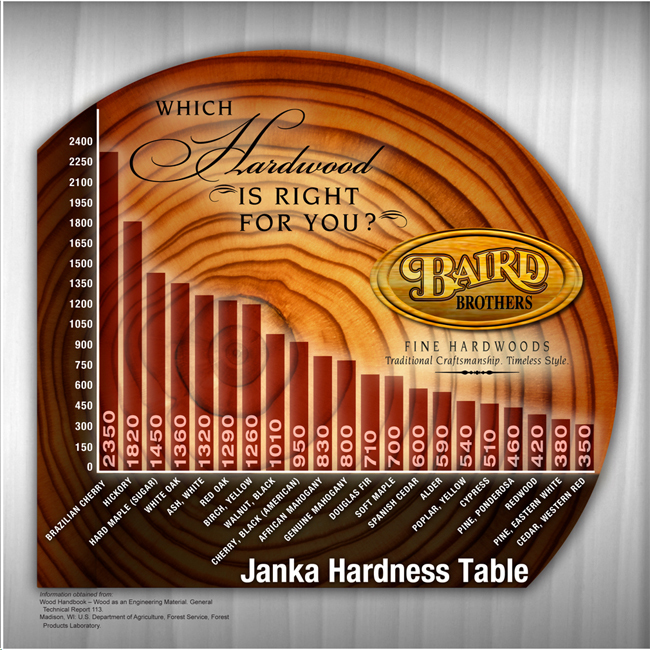 Learn the hardness of each wood species as measured on the Janka Hardness Scale. Hopefully the following information will help you determine which hardwood best meets your lifestyle - especially important when making a buying decision on hardwood flooring. Each specie has unique characteristics, the two most determining of which are hardness and visual appeal or color. The following chart will give you a hardness measurement. The Janka (or side) hardness test, measures the force (pounds/square inch) required to embed a .444 inch steel ball to half its diameter in the wood. These figures are a good indicator of how resistant the wood is to denting and wear.